PixelBerg beta has been updated to version 1.2 and is available to purchase now. 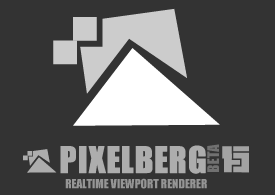 PixelBerg is now available for Cinema 4D r15 (win 64it only). A 32bit build for r15 is highly unlikely as future versions of Cinema 4D, i presume will also only be 64bit so supporting 32bit does not really make sense going forward. Reflectance can now also be set to use metalness maps rather than reflectivity(f0). 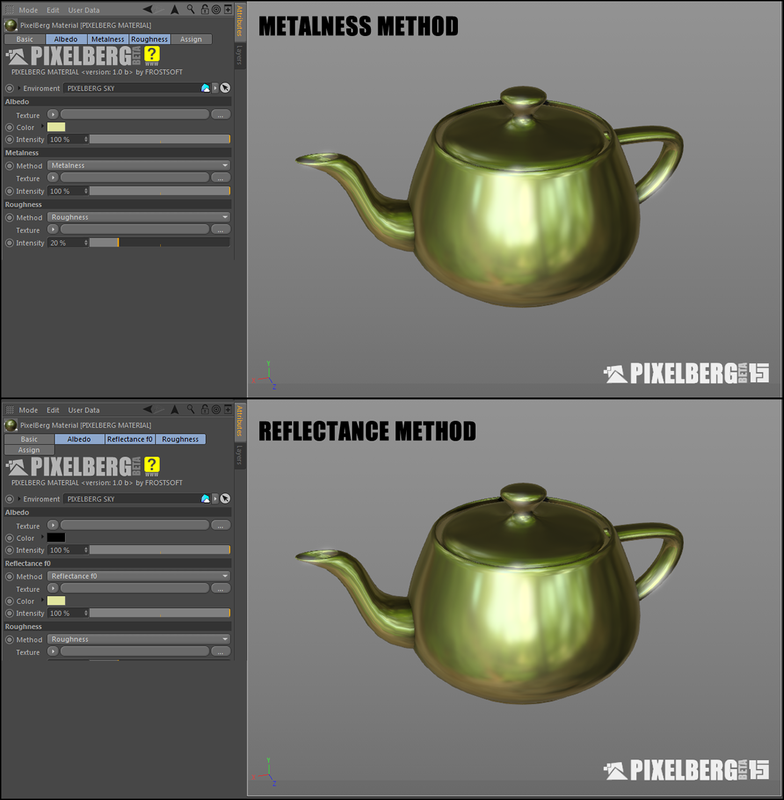 Metalness maps are another popular method for defining reflectivity and are supported by Marmoset Toolbag and used by allegorithmic Substance Painter to name but a few. Metalness maps are a differant way to think about reflectivity which simplifies the user input and is often easier to understand and use. It exploits the fact that the majority of materials actually occupy a very small reflective(f0) range apart from metals,gems and crystals. This is done by the shader actually selecting the final values for albedo and reflectivity dependent on the metalness input value. Using Reflectance if you set the reflectivity color to pure white which means 100% reflective it does not matter what the albedo color/texture is all light is being reflected and no value from the albedo is used/seen. Using Metalness however is different when set to 100% metalness the albedo texture is actually used as the reflectivity(f0) value so this needs to be kept in mind during texture creation. This means that when creating the albedo texture for metalness method the surfaces often have the color you would expect e.g gold surfaces should have a gold/yellowish color then the (greyscale) metalness map should have the metallic value in the case of gold probably white fully metallic. As you can see this can make the textures clearer and easier to create/work with as you would have one albedo map containing the colors you would expect for the surfaces being described and then a greyscale map containing the metallic values. With reflectance however the albedo map using the same example for a gold surfaces would be black (as metals typically have no albedo color) and the (RGB) reflectivity map would have a gold/yellowish color. SSAO has been improved in various ways including new sampling patterns to improve the noise that was visible in the old version. I have also added a drop down which allows you to change the SSAO sample count from LOW to ULTRA (MED to HIGH should be sufficient for most scenes as ULTRA does not really add that much of a visible quality improvement over HIGH). Due to the conversion process the last version produced slightly blurry outputs when compared to the original. The conversion process has been partly rewritten to rectify this problem and produce a higher quality output. On top of this i also now run a small sharpening filter to further recover some of the sharper detail lost in the conversion sampling process. This however does have the effect of making the conversion process slightly longer but i do have a plan to address this in the next release. Although most of the work to do with post effects for this release went into restructuring them, improving stability and SSAO I still wanted to add a new post effect even if it is a very simple one. A vignette is actually an effect produced by a camera/lens defect but can be used for artistic effect to frame or draw attention to the center object. One of the main issues with the previous version was that the first frame of hardware out put would have black smudges artifacts. This was down to a normal buffer not being created by C4D on the first frame of render output when material plugins are used. I be-leave this to be a C4D bug but have implemented an internal work around that fixes the issues for now and forces the required buffers to be generated. Often its the small things that take up most of the development time so here are a few of the more general improvements that were done. Roughness/Gloss is now a drop down selection like Reflectance/Metalness and the group name headings will change to make it clearer what you are using. Texture loading is normally threaded however when using Hardware render output that meant that the textures may not have been loaded by the time the first frame outputs.This has been fixed and all textures are now loaded during Hardware output render before the first frame actually renders. If you made a purchase of Pixelberg in the last 7 days your original download links can still be used to download the latest version. However if you are outside that timescale you will need to purchase again at whatever price you see fit for the latest version. I would like to thank everyone who has purchased pixelberg thus far and hope you will continue to support the plugin. Now that the post effects have been restructured i am going to start work on depth of field post for the next release because it is probably currently the number 1 requested feature.